Yesterday, I cut. Tonight, I am sampling. Cut what? Sampling what? Poly charmeuse for the test run of what shall, Sewing Gods willing, be the wedding dress for a friend. I’ll call her Epona since I can’t find an Egyptian deity that really suits. Anyway, in case you care, some years ago Epona and I were bridesmaids at my Stylish sister-in-law’s wedding (I was actually a last-minute sub in, which is a whole ‘nother long story). So I was pretty amused a few weeks ago when Epona asked me if I would be one of her bridesmaids, again as a rather late replacement. All we need to do now is for me to have a wedding and get Stylish and Epona to be (last minute, replacement) bridesmaids, and we’d have a perfect symmetry. * Since this seems unlikely (although I did spy a GORGEOUS vintage wedding dress at the thrift store last weekend that would, possibly, be worth having a wedding for.) We’ll get to the bridesmaid’s dresses, anyway. At the moment, I’m much more worried about the wedding dress. The final dress will be in SILK. SILK, people. Really, as first wedding dresses go, this one is pretty training-wheels. I mean, Cation just made a freakin’ corseted Victorian evening gown for her bestie’s wedding. 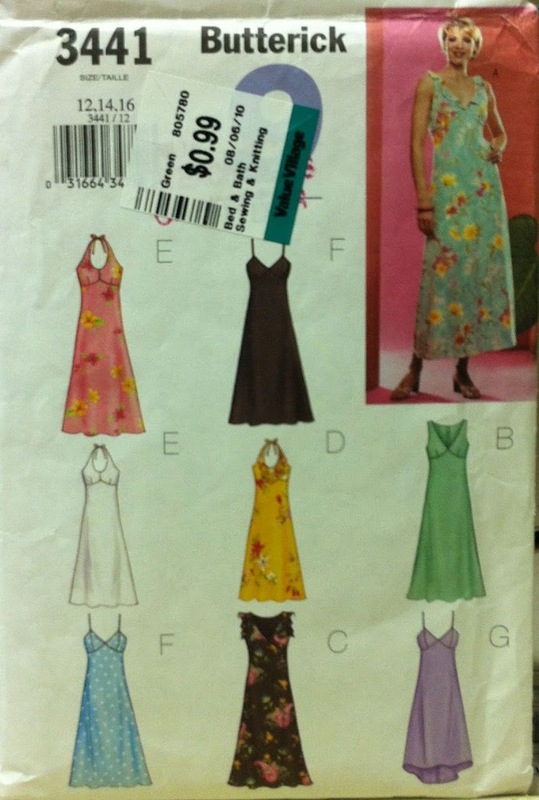 All I’ve been asked to provide is a slightly-amped up version of Butterick 3441, View E. This pattern was an early thrift store score that I probably wouldn’t even glance at if I pawed over it today, but Epona wanted a halter-style dress and a perusal of the current Big 4 offerings didn’t turn up anything she liked better. All I’ve done was mirror the front piece so it could be cut on the bias more easily, (did I mention I suggested cutting the skirt on the bias?) and add a bit of a train on the back. Ok, actually, I just lengthened the skirt on view “G”, which already has a train-thing going. I have a sneaking suspicion this will not work, but we’ll see when I can actually try it on her. I have decided, after much considering, to use my White for this project, despite it needing a bit of a motor overhaul in the worst possible way. The main reason for this is this low setting on the feed dogs, which I am told is useful for slippery, silky fabrics. Like, oh, silk charmeuse. 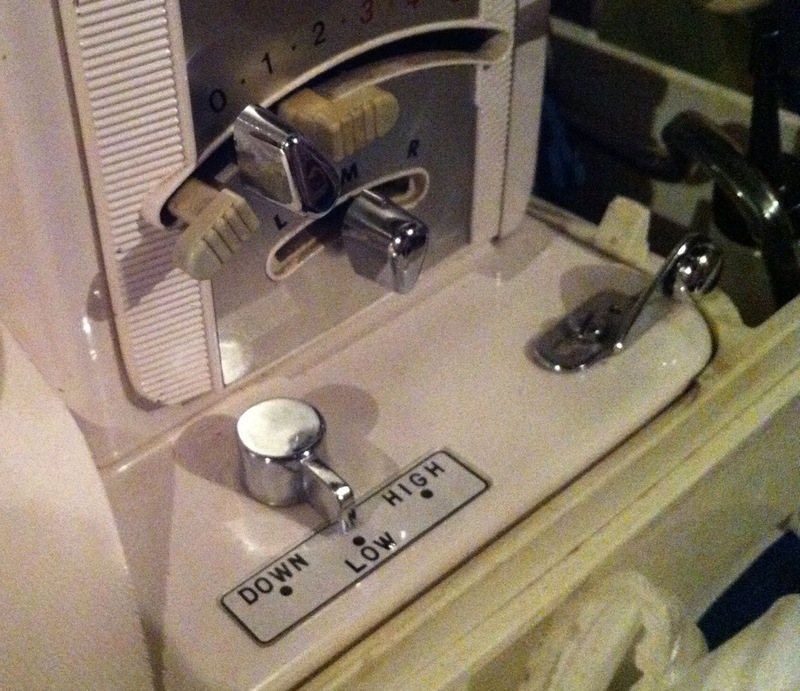 Despite being a zig-zagger, it also came with a straight-stitch needleplate, which is recommended for sewing with fabrics like charmeuse because it is harder for the machine to pull the fabric down into the bobbin. 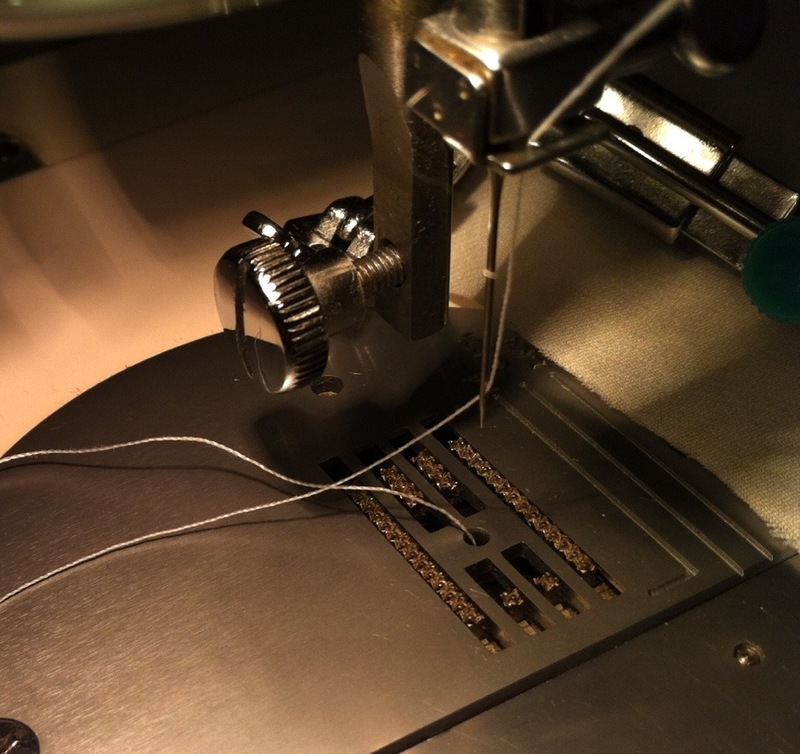 Some people suggest that it also produces a better straight stitch than the zig-zag needle plate. I’m not going to re-unscrew everything to test it out, sorry. I have three different seam-finishes here, two French seams and one stitched and serged. The French seams are obviously prettier, but they are both a little more bulky. (One has the first pass sewn with the serger in an attempt to make a very narrow French seam. It’s not really significantly narrower, though it was pleasantly fast and didn’t need to be trimmed afterward. The stitch & serge one also has less puckering, although some of the stuff I’ve been reading has suggested that silk won’t be quite as evil for puckering as the polyester is? Hey, a girl can hope. I’m not going to go into the details of the cutting techniques since it was, frankly, rather traumatic, but I’m definitely going to sandwich the final silk between layers of tissue. I didn’t want to use any of the spray-and-wash-out methods (spray starch, gelatin) since the final silk won’t really be washable. I’m trying to decide if I should try and hunt down a walking-foot, as I’ve heard they’re helpful for these slippery fabrics, too. I did notice in my sample seams a slight tendency to creep and ripple along the French seaming, which I can correct with some attention, but this was only a foot or so of seam; the dress skirt will be much longer than that. I’ve ogled the one for my Janome several times, it’s not terribly expensive, and I’m hopeful it would fit on the White (which has the same low shank attachment and bobbin-style as the Janome). Anyway, if all goes well, I will be fitting a bride in this by the end of the week, and I will have learned to love, or hate, polyester charmeuse. *I feel a little awkward in my wording, here. You see, I am married, but I never had a wedding. Which by some people’s standards may mean we’re not actually married, to which I say, go jump in a lake. “Dating” stopped being an appropriate word for my relationship with my husband, oh, sometime prior to the birth of our first child. You’re making your friend’s wedding dress? Wow, that’s quite a big deal! I like the pattern, nothing wrong with simple in my book. I am working with a viscose charmeuse right now for my Great Gatsby make and it was a NIGHTMARE to cut out. So, question: what seam finishes did u decide to go with? I’ve no idea for mine. Seems like all of them are too bulky! Good luck with your dress. Can’t wait to see it. Peggy Sagers (Silhouette Patterns) recommends using a teflon foot for all sewing. It might be a good option for your charmeuse. If you can’t get a teflon foot that fits your particular machine, maybe the stick-on teflon pads that are made to attach to regular feet might work. Anyway, good luck with the dress; I’m sure it will be lovely. Also, just thought I’d mention that if you prewash the silk, the dress will be washable after and the bride won’t have to worry about water spots, in case that’s a concern. Good luck! Polyester charmeuse is testing 🙂 Just finished with some, and I think I’ll take a break for a bit now! Heh! Yeah, that’s a good way to put it. At least I didn’t have to worry too much about this version being perfect. I may be in the minority here, but I prefer sewing with silk charmeuse than with polyester charmeuse. For one thing your french seams will be far less bulky with silk, and IMHO the only option. Polyester in any form is evil. I would wash the bridal silk as well, because, well just because. If you do decide to wash it, email me and I will send you details from an early Palmer/Pletsch book about sewing with silk. I have washed every silk I have ever come across and it has never failed me. Do you have Claire Schaeffer’s fabric sewing guide? If not I could send you a scan of what she has to say about silk charmeuse. Lastly a wedding dress? Are you insane? You should only sew wedding dresses for people you gave birth to. Didn’t you know that? I am hoping that the real silk will be better behaved. Most people seem to suggest that. I thought washing the silk made it less lustrous/shiny? Though I have to admit, after working with the polyester I’m thinking it’s kinda impossible to handle satin without spotting water somewhere. good luck, i’m sure it will turn out great! i did a wedding dress once and it was incredibly stressful. it will be a long time before i agree to another! 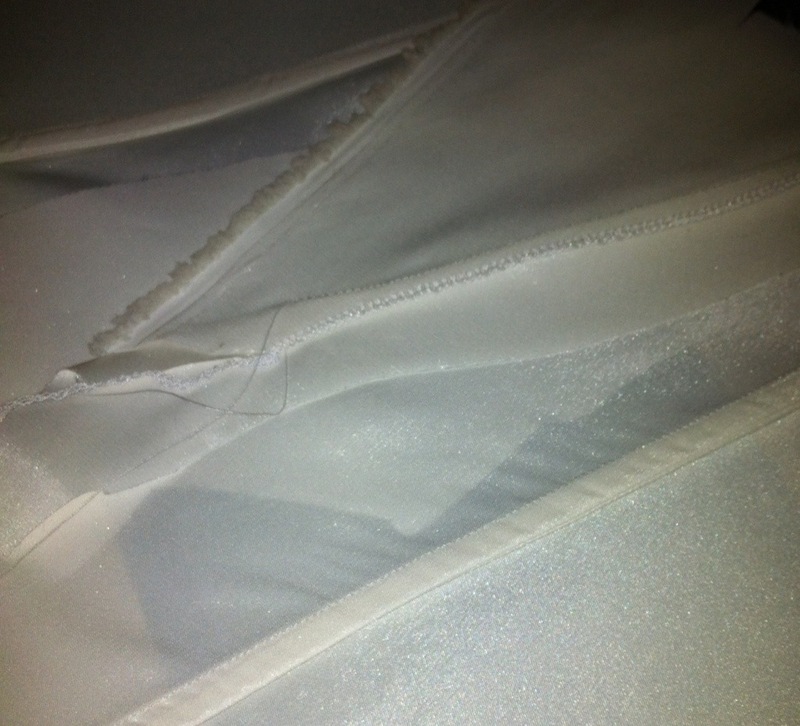 re: french seams… if you stitch the first pass with a very tiny zig zag it helps to reduce puckering. i look forward to seeing it progress! That’s a good idea except that I’m using a straight-stitch needle plate, which seems to really help with keeping the fabric from getting sucked into the machine. But I’m thinking the flexibility of the serged first pass would be the same kind of thing? Yes, get the walking foot. I haven’t found anything better for sewing silk, lycra blends, and other difficult fabrics. A teflon foot is ok but the visibility isn’t great and I feel like it doesn’t do as good of a job as the walking foot. When it comes to bias seams Sandra Betzina recommends using a very narrow zig-zag, I think a 1mm width and 2.5mm length. This helps the fabric relax. I’m not sure if you have a rotary cutter and mat, but I have found that’s the easiest way to cut out silk. Washing the silk won’t be an issue, I do it all the time. The main thing is that sometimes the dyes for silks used aren’t properly stabilized and they’ll bleed a lot, but that won’t be a problem with a white dress. You are braver than I am, I couldn’t imagine sewing up a wedding gown for anyone! Eep! A trick I’ve learned about sewing with poly charmuse is to serge all the edges first. I’m not sure why, but it seems to reduce the slippery factor when you are pinning and stitching. If this dress is going to be your wedding present to your friend, then I would splurge on all the helping accessories you can get: walking foot, expensive needles, etc. I hate poly charmeuse with a vengance because of it’s slippery non-pressable fraying ways, but never had the chance to try silk charmeuse. Oh, you are so brave! 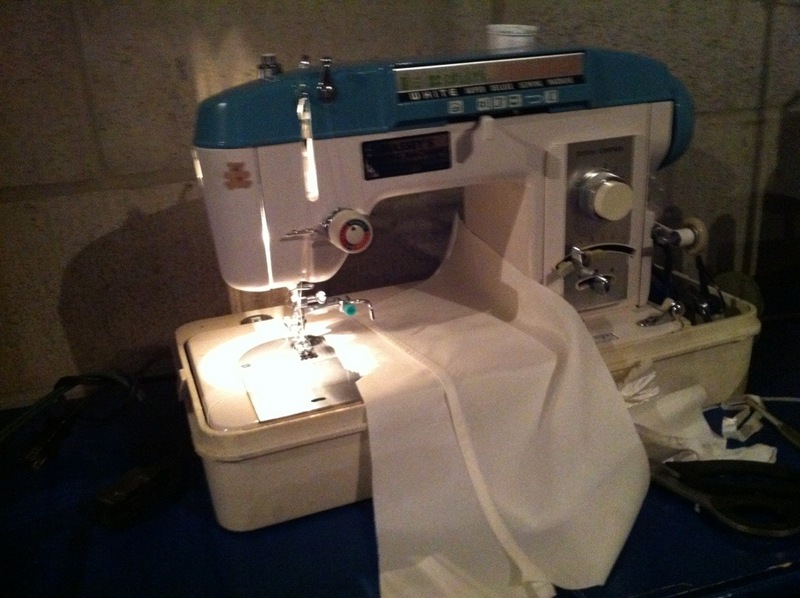 I only ever sewed my own wedding dress. It was polyester satin, which has much the same qualities as charmeuse — I think I ended up pinking the seams, if I did anything at all to what was hiding under the lining. My jacket-over-skirt had fewer fitting issues than the rather lovely halter dress your friend has chosen. (Sometimes the best patterns have the tackiest envelope illustrations, tsk tsk. There are a lot of different views in one envelope: your $.99 was well spent.) Weddings are funny old things, and some people put w-a-y too much emphasis on the ceremony. Mind you, a good party is worth a lot, but the whole rest of your marriage is the thing on which you ought to spend your time, energy, and money, in my non-too-humble opinion. slippery fabric on the bias? you area brave soul. Looks like you are off to a great start with the dress! I don’t know that I would recommend a walking foot for sheer fabrics (I’ve used one mostly for bulky and heavy-duty fabrics, so it seems a bit of overkill on sheer fabric), but the reduced pressure on the feed-dogs is good. Just hold your starting threads tight at the beginning of your seams. You have a very lucky friend! My Pfaff has a built in walking foot, and I still have layers creeping on each other when sewing some seams. A walking foot is nice to have, but you still need skill when sewing with tricky fabrics. If you and Osiris are legally married, you’re married, whether you had a wedding or not. It’s a bit like saying a couple isn’t married because they didn’t have a wedding reception: signing the license is the important legal part. Binding two lives together, and creating a family, is an emotional rather than legal matter anyway 🙂 Though tax breaks are nice! Something has just come to me (I don’t know why at 5:17 am it happened, but whatev), I am wondering whether the serged french seam will show through to the right side. Be sure to test. I rather like sewing with silk. It is a real pain to cut, but for sewing and pressing…it’s sooooo nice! My most recent adventure with it was as a lining to my Minoru. I washed and dried the silk before cutting, pinned the crap out of it (with no lingering holes) as well as serged my seams with no problem. I would think french seams on that dress, however, is the way to go. They will be less bulky than you expect. It’s going to be so ELEGANT! I simply REFUSE to work with any sort of slinky poly. It may say “Charmeuse” on the label, but they are nothing alike! That Poly stuff is shreddy, doesn’t press, melts, puckers, is shiny rather than sheen-y and is oily. I don’t mean oily because it’s a petroleum product, but oily because that stuff slides all over the place. If you can get through making the dress in Poly, the silk will be a breeze. You are a brave soul. There’s no way I’d make a wedding dress for anyone! Not even me! (I’m with you on the married but not thing. Luckily many NZ laws treat de facto couples exactly the same as married.) Good luck with the dress!